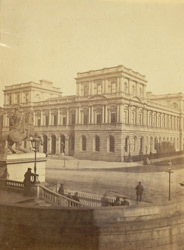 "The foundation-stone of this extensive building was laid in 1861 by the late Prince Consort, the day of the same ceremony in connection with the National Museum of Scotland. It has been the subject of general admiration by all who have studied its proportions and details. It is Italian in style, and constitutes an imperfect square of 180 feet. The Princes Street frontage is only 136 feet; but including the portion of the structure coming in rear of the Inland Revenue Office in Waterloo Place, the breadth from east to west is equal to that from north to south. About 270 persons are employed in it in connection with the various departments of the service; and apartments are also provided for the Board of Lunacy, Scottish Meteorological Society, and other Public Offices. The building does great credit to its architect, and the quality of the work to its contractor, and is another splendid edifice added to the decorations of our Scottish capital."